While sales have become synonymous to long weekends, Marithe + Francois Girbaud shows that you don’t have to wait for the next long weekend just to get a great deal! 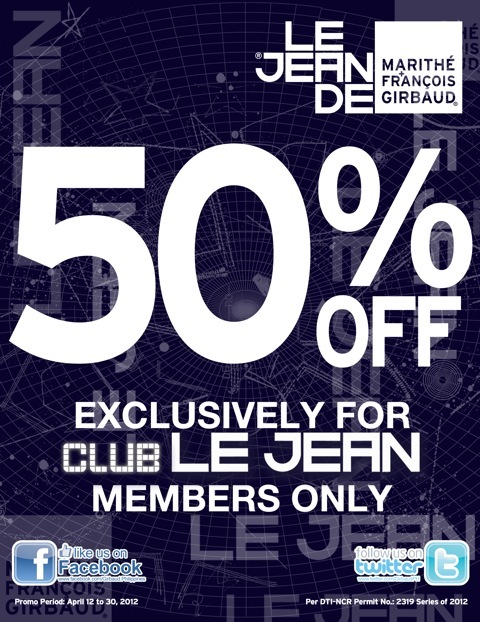 Girbaud offers a 50% discount on its best-selling accessories and all basic jeans and knits for men and women, exclusive to the members of its loyalty program, Club Le Jean. Make your Thursdays to Sundays count by visiting any Girbaud branch from April 19 to 22, and April 26 to 29, and simply present your Le Jean card and rewards booklet to avail of the discount. Become a Club Le Jean member today and enjoy rewards on every purchase, moneyless shopping using your gift points and stamps, and the chance to swap your old pair of denims for a brand-new pair of M+FG jeans! For more details, visit any Marithe + Francois Girbaud branch today. Girbaud is available in SM Supermalls, Robinsons Malls, Ali Mall, Duty Free Philippines Fiesta Mall, Festival Supermall, Gateway Mall, Greenhills Shopping Center, NE Pacific Mall, Pavilion Mall, Sta. Lucia East Grand Mall, NAIA Terminal 3, and now in Robinsons Tacloban, KCC Mall General Santos, and Robinsons Calasiao.